The days are getting shorter and the nights a little crisp. 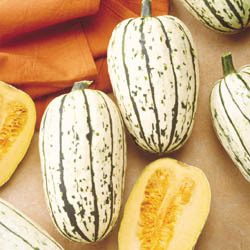 Here in Zone 4-5 we are savoring the flavors of Fall with the sweet tastes of Winter Squash. Squash Sunshine 98 Days. Sunshine is a very attractive winter squash that has a sweet, nutty tasting flesh that is smooth and completely stringless. 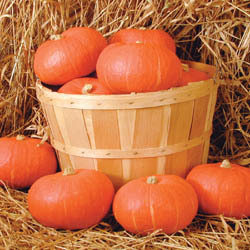 Its bright red-orange rind with thin tan stripes will add color and interest to your fall squash displays. Vigorous, short vines average 8 ft. and produce very good yields of the 3-4 lb. 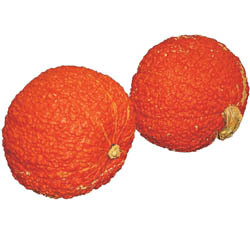 flat-round shaped fruit. 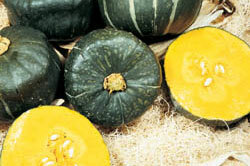 Sunshine is well adapted to any location where winter squash can be grown. 100 Days. This is the original strain of the high quality Hubbard squash. Although smaller than the New England strain, it still produces the classic Hubbard shaped fruit and measures 12 in. long by 7 in. in diameter. The 7-10 lb. fruit will have a blue-gray rind and a sweet, fine textured orange flesh. 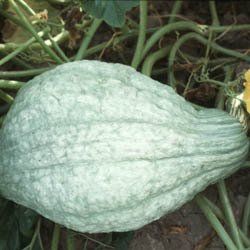 As the name implies, the shape of acorn squash resembles an acorn. 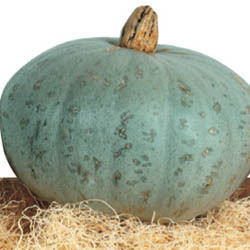 Harris offers the standard dark green acorn as well multi-colored varieties of this winter squash. 85 Days. This is an unusual and colorful hybrid acorn squash. The medium-sized fruit are produced near the crown of the semi-bush plants for easy picking. Their skin is uniquely flecked with shades of green, gold and yellow; each one is different. Carnival stores in fine condition for many months with excellent eating quality. You'll love to grow it and your customers will ask for it by name. Please Note: Color expression is temperature sensitive. Carnival will have less yellow and gold and more green when grown during periods of high temperatures. Squash Confetti 80 Days. Here's a unique little acorn variety that not only works for fresh market sales but it can also be used as a unique fall decorative squash. Bush plants produce 1-2 lb. 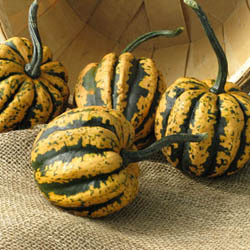 fruit that have a classic acorn shape and a unique beige coloring that is striped and mottled with dark green. Its sweet, orange flesh is less stringy and drier than a typical acorn and has an excellent eating quality. Buttercup squash is a popular type of winter squash, known for its high quality, dry flesh. These varieties have a flattish top and are dark green in color. 85 Days. 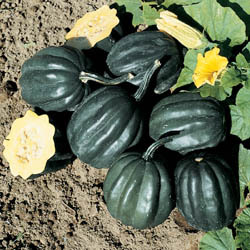 Bonbon is a buttercup squash with a space-saving, upright, semi-bush plant habit. It is a full week earlier to mature than most other buttercup types and has a thick orange flesh that is very sweet and creamy when cooked.Tolerant to powdery mildew. 100 days. 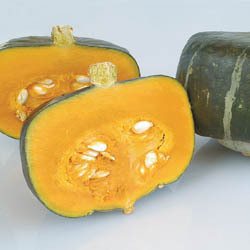 Although a squash, Galeaux d'Eysines is unlike any other squash and will add much interest and uniqueness to any garden. Each fruit has pinkish skin with a sweet, moist, orange flesh, however as it matures peanut-like warts start to develop on their shells. Traditionally used for soups and sauces the 10-20 lb. oblate-flattened shaped fruit are produced on full-size vines. 110 Days. Long, prolific vines produce 2-3' long fruit that weigh between 10-20 pounds. The banana-shaped fruit turn pinkish-orange when mature and have a firm, sweet, yellow-orange flesh that is excellent for pies, baking, and canning. 110 Days. This old heirloom variety is from the U.S. Seed Bank and has an appearance that is perfect for specialty, roadside and farmer’s markets fall displays. Its bright orange fruit are heavily warted and can weigh up to 20 lbs. 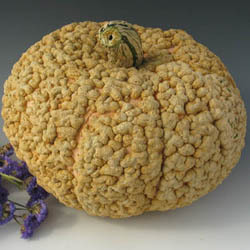 This squash makes a great decorative item but it is also known for its good eating quality and has a Hubbard type flesh and a very hard, thick rind. 110 Days. This unusual winter squash produces spaghetti-like strands of flesh, which add interesting variety to your fall and winter offering. The oblong fruit are 8-10 in. 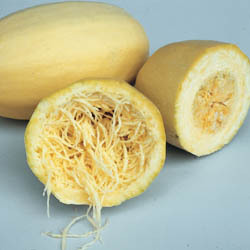 long and turn yellow when ripe. Vegetable Spaghetti is a good keeper and can be stored for several months. Try it for something a little different this year. 103 Days. This distinctive squash has a loyal following throughout the country. Consumers appreciate the smooth, fine texture of its golden-yellow flesh. The medium-sized fruit average 10-15 lbs. and the flesh is extra-thick. Round and quite flattened with a hard, slate-gray rind, these high quality squash keep for many months in storage. In a large microwave safe dish combine squash, onions and butter. Cover and microwave on high for 4 minutes. Peel squash. Stir in broth and cook on high for another 20 to 25 minutes, or until squash is tender. Puree squash, onions and broth in a food processor or blender. Add cream, salt and pepper, and microwave on high for another 3 to 4 minutes, or until heated through. Flavor with nutmeg, cloves and cinnamon to taste. In a large saucepan coated with cooking spray, cook and stir onion in butter over medium heat until tender. Add garlic; cook 1 minute longer. Add the squash, broth, apple, water, thyme and salt. Bring to a boil. Reduce heat; cover and simmer for 20-25 minutes or until squash is tender. Cool slightly. In a blender, process soup in batches until smooth. Return all to the pan; stir in cream and heat through (do not boil). Yield: 6 servings. Reduce oven to 350° F and position an oven rack in the center of the oven. In a mixing bowl with electric mixer, beat the squash with the brown sugar. Add eggs, evaporated milk, spices salt, flour, butter, and vanilla. Beat until well blended. Pour the filling into the chilled pie and place on the center oven rack. Bake for 45 to 55 minutes, or until set. Check after about 35 minutes and loosely set a ring of foil or a pie crust protector over the browned crust so it won't get too dark. When the filling is set, transfer the pie to a rack to cool. Serve just warm or at room temperature with a dollop of whipped topping or whipped cream. Baking Squash is my favorite way to prepare it . Cut your squash in to quarters place them in a baking dish skin down with just a little water..
Add butter and brown sugar to the raw squash. cover them with foil and bake until tender. for an added spice try grating fresh nutmeg and ginger on the squash...or just plain is delicious as well...Enjoy! 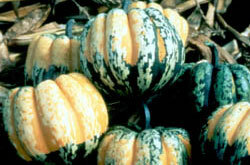 All information and photos for Winter Squash were provided by Harris Seed company.